The heads of the UN and Red Cross have issued a rare joint rebuke to world leaders, accusing them of "disturbing paralysis" in the face of conflict. 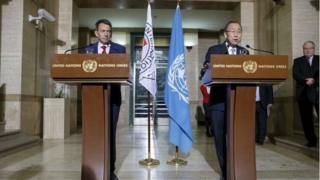 "This flouts the very raison d'etre of the UN," its chief, Ban Ki-moon, said. International Committee of the Red Cross (ICRC) President Peter Maurer said the world had rarely witnessed so much suffering and instability. They urged immediate concrete steps to ease the plight of civilians in places like Afghanistan, Nigeria and Syria. It is the first time the two bodies have issued a joint warning, says the BBC's Imogen Foulkes in Geneva, in a sign of desperation over the spread of conflicts across the world. "Rarely before have we witnessed so many people on the move," Mr Maurer told reporters at a joint news conference with Mr Ban in Geneva on Saturday. He said some 60 million people globally had been displaced from their homes because of conflict and violence - "the highest figure since World War Two". In a statement, the two leaders said today's wars were being waged "in complete defiance of basic humanity". Mr Maurer said this applied to combatants in the conflicts in Afghanistan, Iraq, Nigeria, South Sudan and Yemen. "Every day, we hear of civilians being killed and wounded in violation of the basic rules of international humanitarian law, and with total impunity. Instability is spreading. Suffering is growing. No country can remain untouched," he added. Mr Ban said: "Enough is enough. Even war has rules. It is time to enforce them." Large numbers of migrants have been making their way across the Mediterranean to Europe in 2015, with many escaping war and conflict in their home countries. The UN estimates that more than 700,000 people have crossed to Europe by boat so far this year - many of them refugees from war-torn Syria. The approach of winter has so far done little to slow the flow.